$134.99 Available now including in 2E wide. Out of the box, I found the Hierro v3 to feel a little heavier (1 oz, heavier in fact) and stiffer than the Hierro v2, a bit more dense and "blocky". The upper has changed dramatically, very thick and durable feeling, but perhaps the mesh is a bit closed for good breathability on warmer days. The new booty style with elimination of the tongue looks interesting and the Vibram outsole has changed a little, appearing more durable with slightly reconfigured lugs. The new seamless laser perforated Hyposkin upper is thick and durable feeling. The upper is comfortable and secure, but I do notice that there is very little air flow. 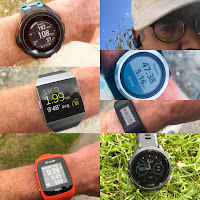 Though my running in the Hierro v3 had been during the winter, we have had some reasonably warm days in the mid to upper 60's and the v3 feels on the warm side. Overal,l I find the upper to be comfortable and secure, I sometimes find my toes coming into contact with the inside of the toe bumper, which is a very rare occurrence for me. It has not yet caused any blisters or significant irritation, but it can be slightly distracting. Fit is good for me, close to true to size, but is on the precise/snug side with not a lot of extra room in the forefoot for swelling (though just enough for some toe splay). Because of the toe bumper being somewhat obvious on the inside, I think sizing up 1/2 size might not be a bad idea for some. Security and foothold throughout are excellent. The Toe Protect bumper has been carried over from the previous version, but it seems a bit more rigid and pronounced to me, such that it is somewhat noticeable to my toes on the inside. The booty style upper eliminates the need for a tongue and provides a comfortable and secure fit. The laces have just the right amount of stretch and interact nicely with the eyelets, never requiring readjustments. Padding around the heel collar is on the thin side, but adequately comfortable. The heel counter is sturdy and protective. The Hierro v3 retains the Fresh Foam midsole, but New Balance has added 4mm to the heel and now there is an 8mm drop vs. 4mm in the v2. It does add some extra protection to the shoe, but along with that comes additional weight. I don't find this shoe to be particularly responsive, at least it does not inspire speed, but protection and comfort are good. The Vibram outsole has seen a minor revamp, as the lug shape/pattern has been improved to help with traction in loose terrain, snow and mud. Overall, I find traction to be average to above average and can hold its own in a wide variety of surfaces. So far, I am finding durability of the outsole to be very good and perhaps a little better than v2. The Hierro is the replacement shoe for the Leadville 1210. Though I liked the Hierro v2, I much preferred the 1210 with the Revlite midsole vs. the Fresh Foam. The Revlite in the 1210 seems to provide a more responsive ride, better protection and held up better over time. I found the Hierro v2 broke down quickly and felt somewhat mushy, whereas the 1210 (all versions) maintain their integrity better over a much longer time period (for the lifetime of the shoe). Overall the Hierro v3 feels like a step backward from the v2. It is heavier, not as well ventilated, not as comfortable overall and feels even more sluggish. Traction is slightly better, as well as overall durability. Despite being a bit of a regression (at least for my tastes) over the v2 and the 1210, I think that the Hierro v3 is a nice trail trainer for slower miles, cooler weather, longer distances and can easily pull double duty as a mountain hiking shoe. It is not a particularly fast or responsive shoe, but is stable, secure, protective and handles most terrain reasonably well. - .5 for weight. 12+ oz. is a lot of shoe. New Balance Hierro v3 vs. Salomon Sense Pro Max (RTR review here): The Pro Max has a more generous fit, yet still great foothold. Traction and stability are better with the Hierro v3, but the Salomon is lighter, more responsive and has better cushioning. New Balance Hierro v3 vs. Hoka One One Speedgoat 2 (RTR review here): The Speedgoat 2 is lighter, faster, more cushioned and has better traction. 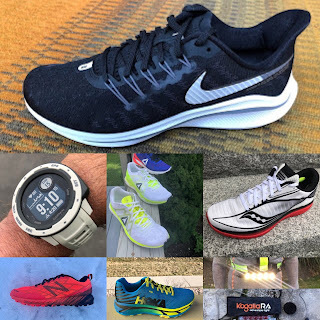 New Balance Hierro v3 vs. Saucony Peregrine 8 (RTR review here): These two are close in weight, but the Peregrine 8 hands down performs better, is more responsive, more comfortable and few shoes can compete with the Peregrine 8 in the traction dept.. The Hierro was provided at no cost. The opinions herein are entirely the author's.